The Opposition Opinion – West Ham (A) – “Rice or Longstaff? I know who I’d want…” – NUFC blog – Newcastle United blog – NUFC Fixtures, News and Forum. 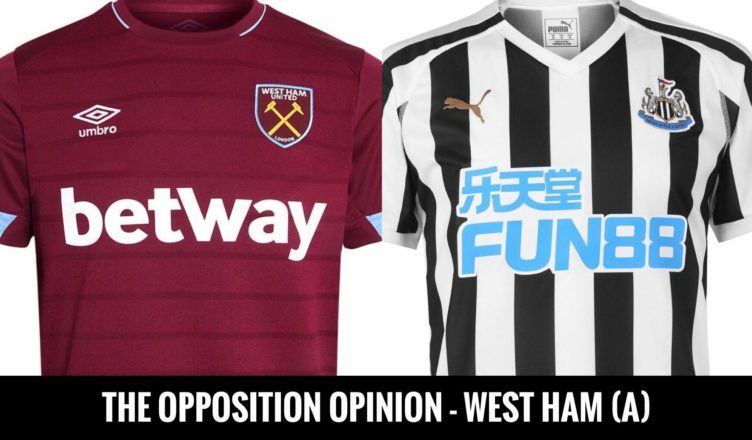 For this week’s Opposition Opinion piece, we’ve been speaking to Hammers fan Callum Donolly this week ahead of tonight’s game at St James’ Park. As ever, we are looking to bring you a view from the other side before this week’s game, interviewing an opposing fan to gain their opinions on NUFC, some insights into their own side and their thoughts on of our upcoming match. Q1) – What sort of shape are you guys in coming into this one? Feeling confident? “We’re on a poor run really. We limited Man City on Wednesday but aside from a scruffy win over an awful Fulham side last Friday, we’ve not won since early January. “We’ve got some good fixtures coming up and need to make the most of them if we’ve got any chance of finishing 7th and sneaking into the Europa League. “On the plus side, Arnautovic and Noble have been rested and should be back and we’re also excited to see Lanzini back too, so we do have some momentum…and we’re often strong at home and hard to beat. “I’m not that confident after seeing you beat Burnley so comfortably in midweek, but I think we’re due a win…and you’re due a bad performance! Q2) – Who are the strengths and weaknesses in your current side? Any ‘ones to watch’ that most NUFC fans wouldn’t know much about? “Our main was Arnautovic last season and we struggled when he didn’t turn up, but this season we have Felipe Anderson…someone who must be one of the best players outside the top 6. “He’s quick, has a wand of a right foot and his footwork is brilliant. We won’t keep him for long if we don’t start pushing on. “Arnie has the ability to tear any defence apart if he fancies it, Rice has been outstanding in midfield and I’m also liking what I’m seeing from summer signing Diop, a big 6ft 4′ centre-back from France, and Fabianski; a keeper who just looks like he’s never going to concede some days. “Weakness has to be at full-back. Zabaleta is too slow and could be a dream for a player with Almiron’s pace, so we’re all hoping Fredericks starts instead! “We’re not too clever on the other side either, with Masauku being skilful but not having a defensive bone in his body and Cresswell looking out of sorts for a while now”. Q3) – Which players do you see as the strengths and weaknesses in Newcastle’s side? “Starting with weaknesses, I think Anderson could give Yedlin the run around. He has pace but Anderson is relentless and a quicker thinker. Felipe’s not been at his brilliant best of late, but I fancy him to do damage if Yedlin isn’t on it. “Always thought Perez was a little overrated, but interested to see what Almiron’s like considering he was one we were linked with over the summer. He looks a talent but it’s easy for you boys to get a little carried away when you’re not used to seeing £15-20m players! Harsh but true..
“Your most talented player is Shelvey for me, so I’m glad to see he won’t play. That being said, Longstaff has looked and probably covers much more ground which is needed in a team like yours who has less of the ball. Q4) – What sort of game do you think it’ll be and how do you see it panning out? Score prediction? “I fully expect you to sit in and try to frustrate us, although I think confidence from recent wins and your new attacking flare could see you attack more than you have in the past. “Either way, you seem to be a counter attacking team and I’m wary of both Almiron and Yedlin’s pace and Rondon’s power. “I think we could have too much for you mind. If Anderson has Yedlin on toast, Arnie is back and Lanzini too – who has been out for a long time now but was one of our best players last season – then I think we’ll win. Q5) – It’s reported that our top youngsters Declan Rice and Sean Longstaff will be watched by England officials in this one. What do you make of those two? ‘Rice or Longstaff? I know who I’d want…and it’s not Longstaff! “I have been very impressed by him mind, but Rice has been playing at a high level in our side all season…where as Longstaff has done it for a month or two at best. “Rice really does look to me like a top player and someone who’ll be playing regularly for England before long. Q6) – If you could sign one player from this NUFC side, who would you like to see Manuel Pellegrini go for? “We need a full-back but I can’t say you have any I rate! Dummett’s solid but not suited to a team like ours that try and play football. Q7) – Finally, if you had our two squads to choose from and were asked to pick the best possible side, what would you starting 11 be? “(3-5-2-) – Fabianski – Diop, Lascelles, Lejeune – Almiron, Rice, Shelvey, Lanzini, Anderson – Rondon, Arnautovic. A big thanks to Callum for taking some time this week to speak to us. It sounds like Anderson vs Yedlin will be a key battle if what he says is anything to go by – and I’d tend to agree when you consider it’s their best player against our weak link from a defensive perspective. Next up will be the thoughts of an Everton fan ahead of their visit to St James’ next weekend. I just compared the NUFC XI that started at West Ham last year vs the 11 set to play today – What a difference..